Don't deal with the hassle of driving or finding public transportation to the Citadel Outlets -- instead, enjoy this convenient transfer service and discount package! From your Los Angeles hotel, spend a full day shopping for your favorite brand names such as Coach, Michael Kors, Calvin Klein, Banana Republic and H&M, all at huge discounts. Have a late-night departure out of LAX and want to squeeze in some shopping? This is the perfect way to do it. Even if you don't have a flight and just want hassle-free round-trip transport from your hotel to the outlets, you'll love this transfer service. Your discount package includes a gift bag, shopping bag and luggage storage, a VIP savings card, a Citadel Outlets gift card and access to the VIP Lounge, depending on the option you select. Transfer with Departure Flight: Los Angeles Hotel to Citadel Outlets to LAXThis option is for those who have a late-night departure out of LAX. 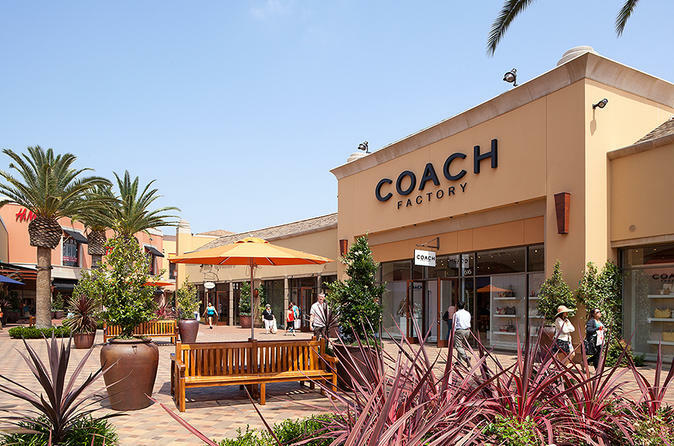 You’ll be picked up from your Los Angeles hotel at your chosen time and taken to the outlets for a full day of shopping (recommended hotel pickup time is 11am). This option also gives you access to the VIP Lounge, with all the amenities included in the option above, plus a VIP savings card to all shops and a complimentary Citadel gift bag. At the end of the day, hop aboard the shuttle and head to LAX for your flight. Pickup times are 6pm (for flight departures between 9:30pm and 10:30pm) and 7pm (for flight departures after 10:30pm). You may also only select the transfer service. This package includes a VIP saving card to all shops, a complimentary Citadel gift bag, complimentary luggage storage for the day and a USD$20 gift card for each adult and USD$15 for children ages 3 to 9. These can be used at any of Citadel's stores or restaurants! Hotel Transfer: Los Angeles Hotel to Citadel Outlets to Hotel If you don’t have an LAX flight and just want round-trip transport from Los Angeles to the Citadel Outlets, this option is for you. Hotel pickup times are available upon request, but it is recommended that you choose a time of around 9:30am. This package includes a VIP saving card to all shops, a complimentary Citadel gift bag, complimentary shopping bag storage for the day and a USD$20 gift card for each adult and USD$15 for children ages 3 to 9. These can be used at any of Citadel's stores or restaurants! At your chosen time (around 3pm is recommended), hop aboard the shuttle and head back to your LA hotel. Please note: Flights are not included with this package; this is a transport-only option.